July gardening tips: It's harvest time! 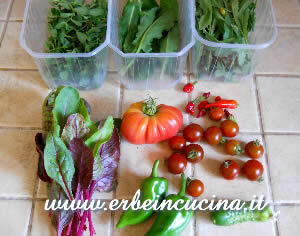 During the weekend I manage my garden and rooftop products, storing or cooking them. Here's my harvest, along with some ideas, recipes and suggestions. My aromatic herbs (not in the group picture): rosemary, basil cinnamon, a little of celery, marjoram, curry plant, Thai basil, lemon balm, rhubarb. This harvest goes to Harvest Mondays. 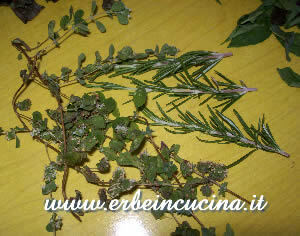 I will add rosemary and marjoram to an herb mixture similar to italian seasoning that I'm creating. 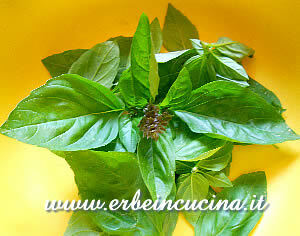 EDIT: the Mediterranean Aromatic Mixture recipe. I'm creating also an oriental herb mixture with thai basil, cinnamon basil (in the picture), curry plant, lemon balm, chives garlic, lemon balm and some spices. It's an experiment, I will let you know. 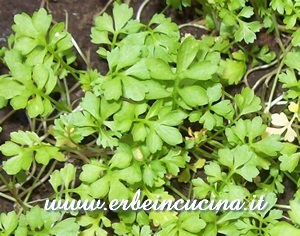 EDIT: Asian Aromatic Mixture recipe. 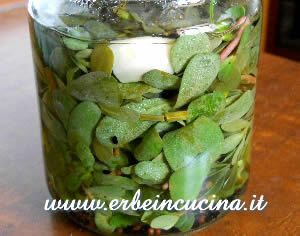 I also prepared Pickled Green Purslane, fairly faithful to my recipe (with garlic, mustard seeds and nigella), but I also added a small celery stalk, diced. 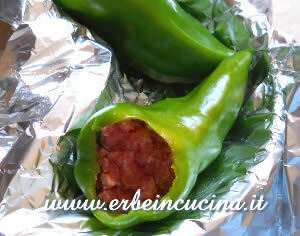 I stuffed the Pimento Piquillo with some soft pecorino cheese cubes and minced beef meat. I wrapped them with aluminium paper and baked for 10 minutes. They were delicious. 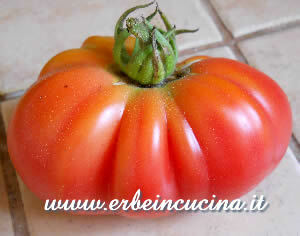 A picture of my first Bear Claw tomato: it's a steak variety, pinkish red, big and sweet. I'm growing a gherkin plant in my rooftop, they are so delicious that we are eating them fresh instead of preparing pickles. 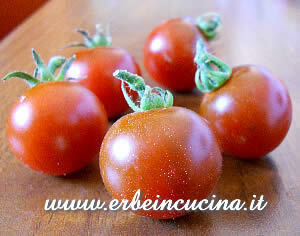 With these Cherry black tomatoes I prepared the recipe Couscous Salad with Cherry Tomatoes and Aromatic Herbs. Three years ago: Sensitive weeds? Very nice harvest...the stuffed peppers look yummy! Happy Harvest! Grazie! Forse usavi caratteri particolari che generavano un errore... il motore di questo sito è fatto in casa: completamente personalizzato ma qualche difetto ogni tanto viene fuori. Your harvest looks lovely. How do you dry lemon balm? I ve tried so many times, but it always loses its wonderful lemon scent. Hi Daphne, put lemon balm leaves in a ventilated, not humid, dark place (sunlight can cause leaves to loose color and flavor). After about a week store in a jar away from light and heat sources. 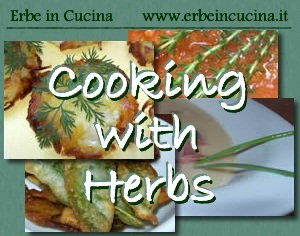 As many herbs, dried Lemon balm will lose part of the aroma, but not all.